Rent a Car in with Etisalat Smiles Coupons. Get up to 50% off. 1. Rent a Car on Monthly lease rentals - Save you upto AED 250 . 2. Rent a Electric Car at an Introductory offer – Save flat 50% off on Daily Rentals. You surely don't want to miss these DEALS ON WHEELS. You can be assured with the service as we host a fleet of over 2000 cars and serve Dubai, Abu Dhabi, Sharjah, Ajman, Ras Al Khaimah, Al Ain and Fujairah with 15 counter across UAE. Dubai | Abu Dhabi | Sharjah | Ajman | Ras Al Khaimah | Al Ain | Fujairah. Coupon available till 31st December 2019. 1. Offer valid for 1 reservation only. 2. This offer is valid on select cars only. 3. This offer is valid on Daily Rentals only. 7. The offer is valid till 31st December 2019. 8. Rental payments by Credit Card Only. Excess / Deposit Needed. 9. Rental confirmation and Car allotment are subjected to proper client documentation. A)	International Drivers License, Passport and Visa Copy for the visitors & Valid UAE Drivers License, Emirates ID for residents required. B)	Credit Card Copy required for all reservations. 10. All costs incurred as results of fines, salik and other penalties (Imposed by the traffic police or any other authorities for traffic violations) that takes place will be the renter's responsibility and recovered accordingly. There will be additional 10% service charge on the top of all the fine charges. For Salik AED 1/- will be extra surcharge per crossing. 11. 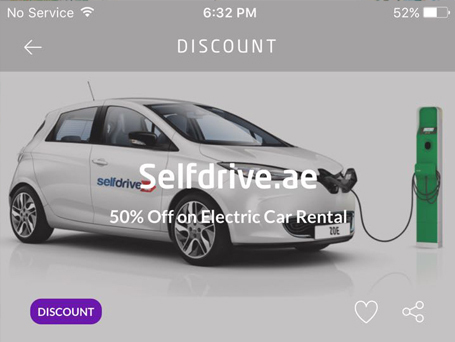 Min 2 days prior booking is required to arrange the vehicle or else Selfdrive.Ae management has the right to refuse any voucher if required vehicle is not available. 13. Offer to be redeemed within 15 days from date of voucher download. 14. 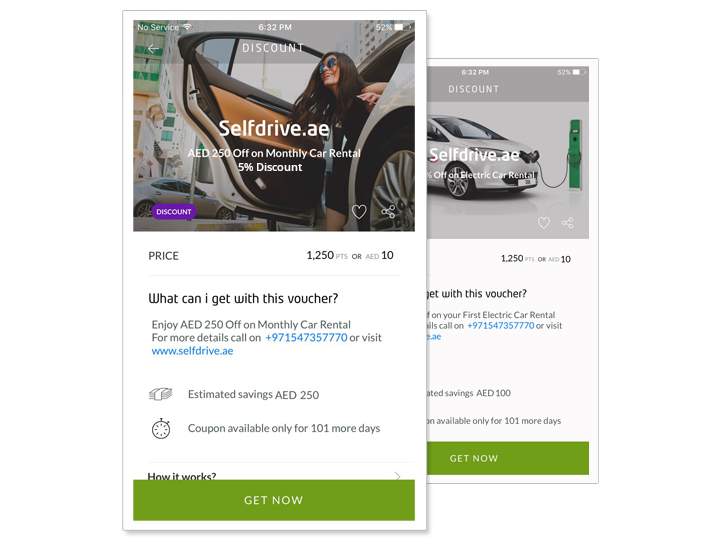 Standard terms and conditions of use applicable as mentioned on the selfdrive.ae website. 2. This offer is valid on Electric Car Renault ZOE only. 4. This offer is not valid on extension of the same reservation. 5. This offer cannot be combined with any other offer. 6. The promo code cannot be redeemed for cash. C)	International Drivers License, Passport and Visa Copy for the visitors &Valid UAE DriversLicense, Emirates ID for residents required. D)	Credit Card Copy required for all reservations. 10. All costs incurred as results of fines, salik and other penalties (Imposed by the traffic police or any other authorities for traffic violations) that takes place with be the renter's responsibility and recovered accordingly. There will be additional 10% service charge on the top of all the fine charges. For Salik AED 1/- will be extra surcharge per crossing. 11. Min 2 days prior booking is required at arrange the vehicle or else Selfdrive.Ae management has the right to refuse any voucher if required vehicle is not available. 12. Offer is subject of availability of vehicle. 13. Offer to be redeemed with in 15 days from date of voucher download.